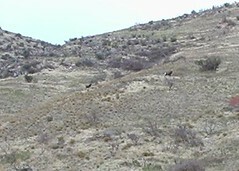 While riding today we saw a couple of bighorn sheep. We ran into these sheep once before when they were on a trail and had a real close look at them. Today they were a bit further away so my low quality camera didn't get a great picture. Bighorn sheep we saw today.